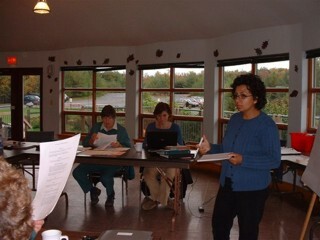 The Outdoor Centre at Little Cataraqui Creek Conservation Area is a unique location to hold a business meeting or a special event. Easily accessible from Highway 401, it boasts spectacular views of nature, just minutes from downtown Kingston. The West Hall in the Outdoor Centre is available for rental by businesses, organizations, and individuals. There are two large rooms, each accommodates up to 70 people depending on seating arrangements. The West Hall offers your group a relaxed atmosphere with a panoramic view of the wetlands and surrounding forest. An adjoining snack bar and full kitchen allows for easy food service. Kingston is located within a two-hour drive of Toronto and Ottawa, three hours from Montreal and just 30 minutes from the USA border crossing, making it a central location for your get-together. We offer easy access, free parking, and flexibility in adapting the food and decoration that you desire. Just give us a call to inquire about availability and rates at (613) 546-4228 ext. 222. Birthdays, anniversaries, retirements and other occasions are even more special in the intimate setting of our Outdoor Centre. While we are not able to accommodate large functions, we are ideal for those who are looking for something a little bit different for their special event. The West Hall can accommodate 50 people for a sit-down meal, depending on the set-up required. We offer complete flexibility in providing food and refreshments. You can supply your own food, have a potluck, or hire your own caterer. The West Hall rental includes a limited kitchen, we do not have dished or cutlery. Our special event package prices are shown below. Please note that our rates do not include HST. These rates are for special events held on weekends (Friday night to Sunday night). Rates for business meetings are shown below. *Rates do not include HST. Additional time is available for $60/hour. No events past 9:00 PM. Rental rates include set up and use of our tables and chairs within the building. Cleaning fees may be assessed for large events. You must arrange for your own caterer, dishes, cutlery and linens. No alcohol is permitted. Advanced payment by Visa or MasterCard is required. Prices are subject to change. Looking for a unique place to hold your next meeting, seminar, or retreat? The West Hall at the Outdoor Centre at Little Cataraqui Creek Conservation Area is peaceful and quiet – a natural getaway from the frantic pace of the city. After all, where else can you step outside for a real breath of fresh air in the great outdoors on your coffee break, while only minutes away from the heart of Kingston. The Outdoor Centre is an ideal location for a business meeting or retreat. It is easily accessible from Highway 401 and downtown Kingston and has ample free parking. Kingston is located within a two-hour drive of Toronto and Ottawa, three hours from Montreal and just 30 minutes from the USA border crossing, making it a central location for a regional meeting. Easy access from Highway 401 and lots of free parking make the Outdoor Centre a convenient place to meet. Customize your event with a nature hike. Not only will your group enjoy our natural setting, but they will return refreshed, more productive and ready to take on the rest of the day. Hold your event in the winter and include some cross-country skiing on or our 13 kilometres of groomed trails. Or, how about some snowshoeing? We offer complete flexibility in providing food and refreshments – arrange your own catering or leave the arrangements to us for a fee. Our business meeting rental rates are shown below. Please note that our rates do not include HST. These rates are only for meetings or seminars held from Monday to Friday. Additional time is available at $60/hour. You must arrange for your own caterer, dishes, cutlery and linens. Special arrangements must be made to use the building after 9:00 PM or before 8:30 AM. Additional charges apply. All of the above are daily rates. Screen, lectern and microphone are available without additional charges.